Mission and Vision - eZee Technosys ( M ) Sdn. Bhd. eZee Technosys is founded on a simple belief, “The software you choose should go with your business; not your business with the software you choose.” That’s the reason we are in the hospitality software solutions industry – to create solutions that gel completely with your existing business and do not require you to change your entire business to accommodate the solution. eZee is an innovative IT solutions company based in Surat, India. Founded in 2005, eZee is focused on creating cutting-edge solutions for the hospitality industry, solutions that complement your business and improve its efficiency and bottom line. Founded on a humble platform and with the idea of developing ingenious solutions for the hospitality industry, eZee achieved quick success with its first and flagship product – the eZee FrontDesk PMS. Within a short span of ten years, eZee has quickly grown from its based in Surat to boast of nearly 5,000 client installations across 140 countries. Success has also brought new partners and we today have a strong network of 38 plus resellers working from different countries. Our passion for cutting-edge technology and research has helped us develop many more insightful and innovative solutions for hospitality. These include Hotel Management System, Cloud based PMS, POS System, channel management software, web-based booking engines, Digital Restaurant Menu, Digital Feedback System and Hotel App Builder. 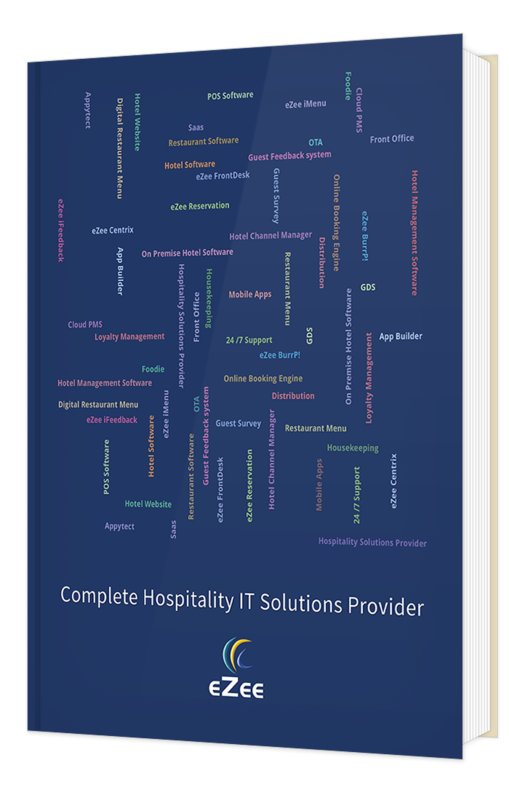 Each software developed at eZee is the culmination of exhaustive research into the requirements of our clients and the demands of the quickly growing hospitality industry. This research has allowed eZee to develop solutions that go beyond their primary application of aiding your business; they become a major growth factor. Another major aspect of eZee’s solutions is the continuous upgrade of existing modules and addition of new modules. Where possible and as part of our commitment, we provide these new developments to all our clients at no additional cost. After all, we have to live up to our name – eZee – which for us, stands for making life and processes easy for our clients. eZee Technosys is a software firm specializing in developing and delivering products for the hospitality industry. The eZee company profile introduces eZee’s management, company’s core values, product line up, development expertise, and reach in the global hospitality market. We hope that our clients, channel partners, and technology partners are able to gain a better insight of our company. While clients have been the life blood of eZee, our team has been the driving force behind our growth. eZee is proud to say that we have a team that is the right mix of specialists and generalists. While our technical backbone is strengthened by some of the sharpest software engineers in the industry, our marketing strength can be attributed to our out-of-the-box thinkers of the sales and support team. Both teams draw further strength from our team mentors and managers, all of whom are veterans of the hospitality industry. The insight that these mentors and managers bring with them has been instrumental in the success achieved by all of our products. Every member of eZee’s team firmly believes in the company’s primary goal of making hospitality management easier for clients. Their single-minded dedication to this goal has resulted in every solution crafted turning into a success story. This dedication of our team members and of eZee as a whole is summarized in a single statement, which also features strongly on our corporate attire and says, “I am eZee”. What "eZee" stands for ? The name eZee is derived from the word “easy” which stands for simplicity. At eZee Technosys, eZee means an attitude and aptitude for developing solutions that make business and property management for our clients “easy”. It also means "easy" access to new-age technologies and research into ways of simplifying the domain that is the hospitality industry. eZee’s logo is that of three cresting waves, each in a different color. The first and biggest wave is green in colour. Green signifies stability, which is one of the founding principles at eZee. The biggest wave on the other hand indicates the long term and wide vision of eZee to create the most comprehensive possible solutions for the hospitality industry. The middle wave – about to break – is yellow. Its colour represents the excitement that every team member of eZee finds in creating innovative answers for simplifying the hospitality business. The breaking wave is an indicator of the success that eZee has achieved and the many milestones that are yet to be achieved. Blue represents truth, honesty and loyalty. It is also considered to be a humble colour. In our logo, it is the colour of the smallest wave to depict our humility. For us, clients are the most important aspect of our business and we will always be honest in fulfilling our commitments to them – just like the meaning of the colour.